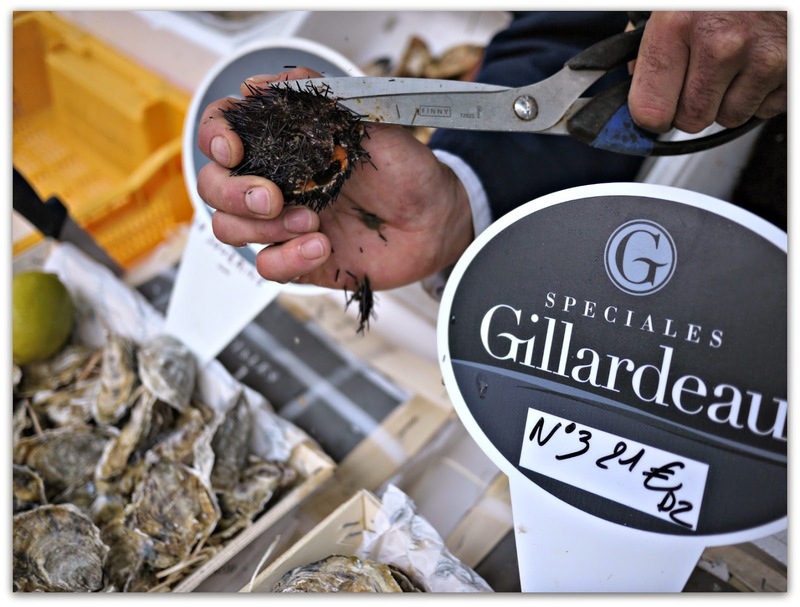 Today, one of the Poissonnerie (fish and seafood specialist) was selling oysters and sea urchins for the first time this season so his stand was 3 deep with customers for most of the morning. I squeezed on by, thinking I'd wait until the crowd thinned. 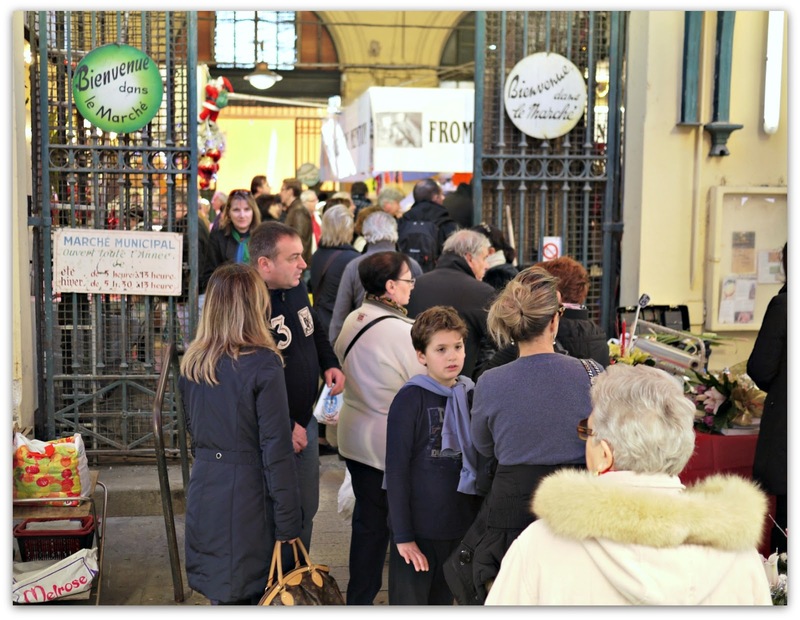 After I'd finished my shopping, I looped back and saw that there was a lull in the crowd so I scooted over for a closer look and to take some photos. I'm a vegetarian, so for me seafood is purely a curiosity and photo opp. It didn't disappoint. 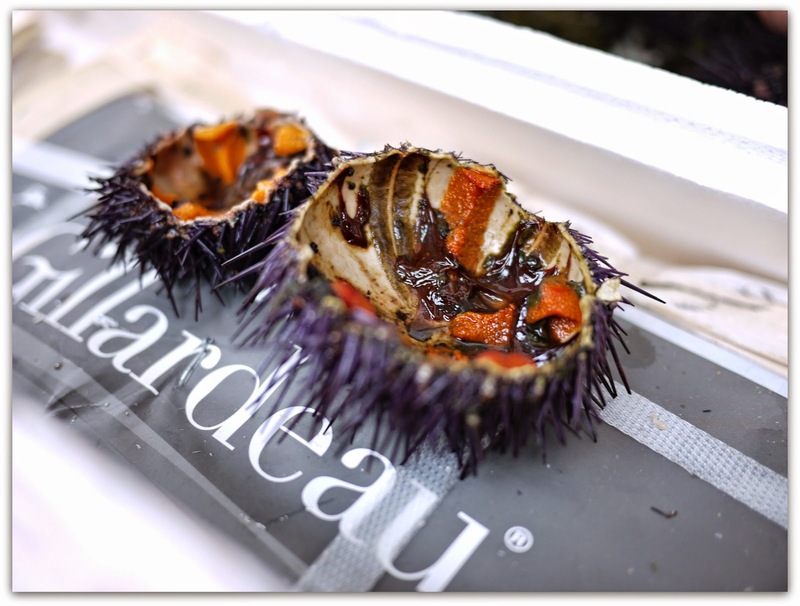 To me, sea urchins seem like the artichokes of the seafood world, their nasty spikes guarding their luscious interiors. Unless you understand how to prepare them, you avoid them. While I was taking photos, head down, I heard a young boy behind me in the crowd asking the Poissonnier in perfect French, "would it be at all possible to have a demonstration of how to open them?" What an enlightened child, I thought, me snapping and clicking away, eyes down. And what a great chance for me to get some interesting photos. I kept my attention on the poissonnier's voice and hands as he deftly grabbed a spiky urchin in his palm, and ignoring the sharp spikes, cut it in half through the middle with heavy metal scissors. As he progressed through each step of the process, he described his technique to the young boy who had moved closer to the front of the little crowd that had gathered behind us and now stood right beside me. 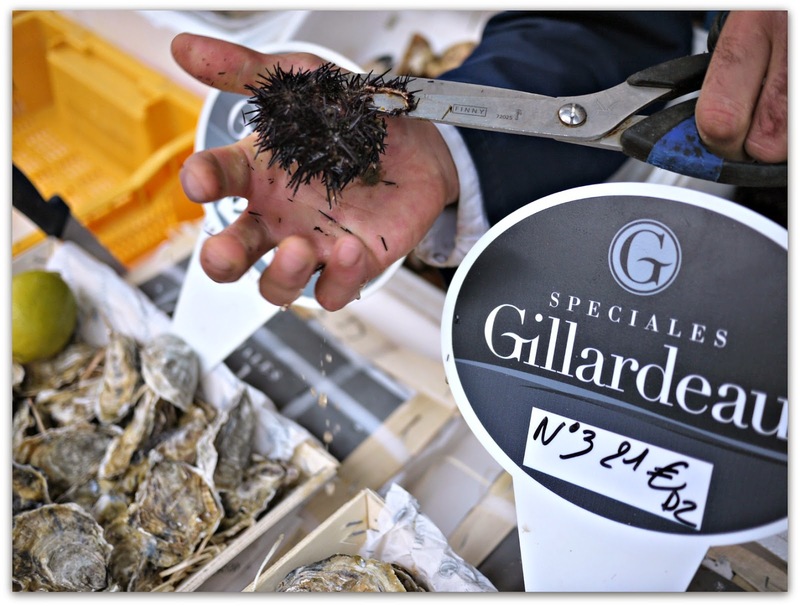 When the Poissonnier had finished opening the sea urchin, he put down his scissors, shook the sea water out of both halves and pulled out a spoon. He scooped out some of the orange paste from the inside and held the spoon out to the boy. I turned to see the boy's reaction to the moment of truth and it was then I recognized him. He was the young son of a dear friend of mine. With this distraction, another member of the audience shot out his hand so he was the lucky one who got to sample the sea urchin. With that, the show had drawn to a close so we went off in search of his mum. En route we chatted and I got the rest of the story. 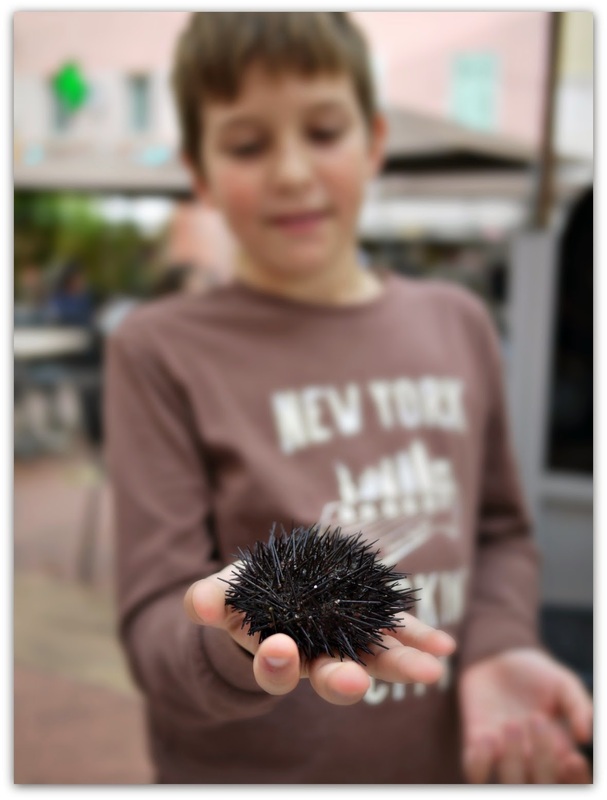 It seems he was trying to convince his mum to buy him some sea urchins and wanted to gather a bit of knowledge so he could prepare them himself. I felt obliged to champion his cause. What I loved about this tableau was that my friend's son is barely 10 years old. 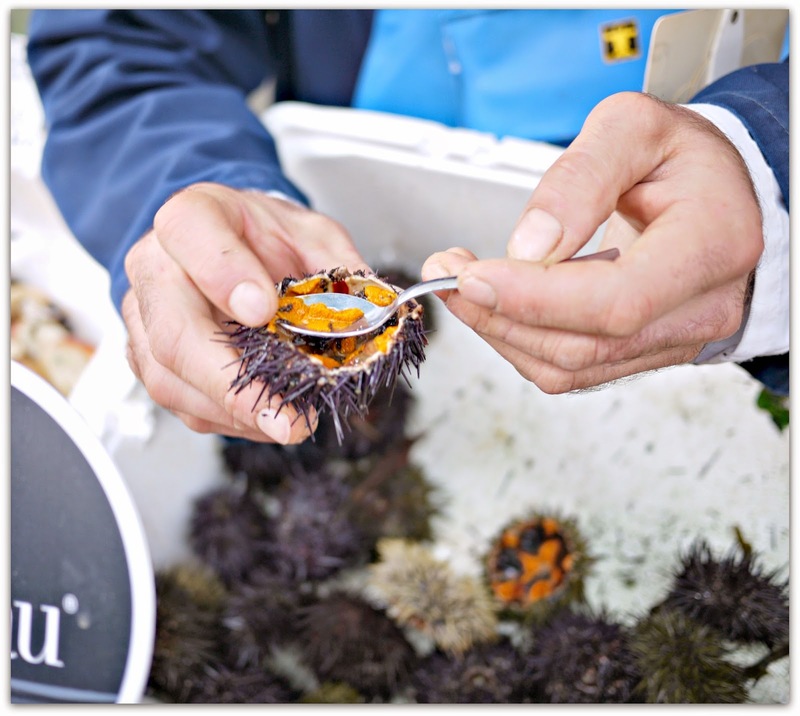 I think he showed considerable culinary maturity to want to try something as unusual and singular as sea urchin. They aren't the prettiest of things to eat, an acquired taste I've been told. It made me wonder if adventurous taste in children can be nurtured or it's more nature? I think with my friend's son it was nature. His mum tells me he's always been open to trying new things. I'd have to close my eyes to try that. I thought it was full of orange goo inside. I too would not eat any offal no matter how much it is loved. 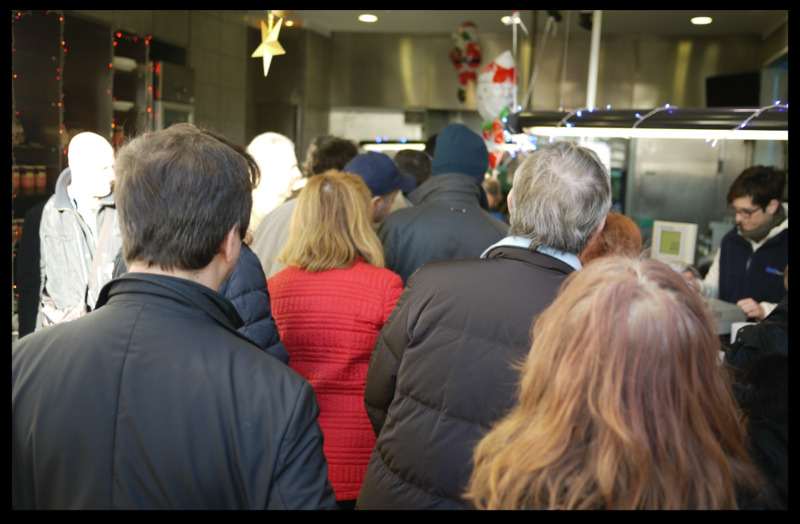 What a crowd for the market. Even if I ate seafood I think I'd have to do the same! A wonderful story, I so wish my children were not so conservative though in the case of my daughter, now 30 and as conservative as ever, I put it down to her early years in Sweden where elk and reindeer and lashings of dill all featured high amongst the local baby foods. Your daughter is a trailblazer. Sounds like the daily menu at NOMA! I love sea urchin! We're landlocked here in Toronto, so although we get nice seafood at the markets I've never seen sea urchin in its spikes for sale. They are definitely pretty! I guess there are no Sea Urchins in Lake Ontario. Pity.